We still haven’t heard back from Verizon after asking for an update on their supposedly incoming new device unlock policy, where they may temporarily SIM lock devices for a period of time after purchase, but our article from last week on the subject may have moved them in the direction of finally unveiling it. Verizon appears to be rolling out a new device unlock policy as I type this, one that will lock devices for 60 days post purchase if you buy at full retail, but could extend out for the life of a contract on a device payment plan. As of today, Verizon’s device unlock policy remains unchanged. We can’t tell you what it will be tomorrow or next week. My guess is that it’ll look like what you see below. It sure seems odd to us that an entire policy change was written up and then posted to device pages for almost all to see as they browsed Verizon’s site, yet was inaccurate and not the future policy. We’ll let you know as we learn more. 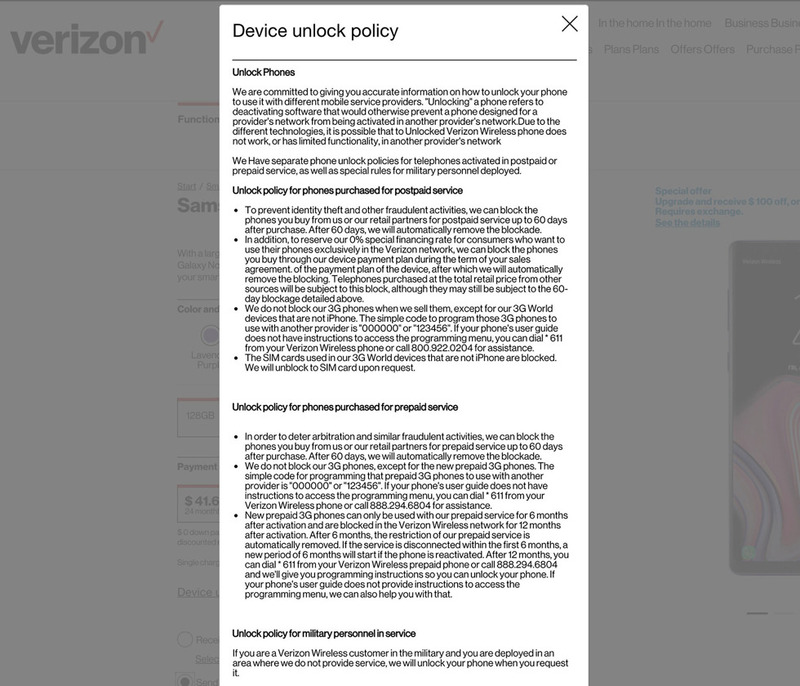 The new unlock policy hasn’t yet replaced their publicly posted policy (here), but Verizon was showing the new policy yesterday on device pages. They have since removed links to it. However, we were able to access it again today on some of their Spanish device pages, thanks to our friend, Google cache. The new postpaid policy will be put in place to “prevent identity theft and other fraudulent activities,” according to Verizon. They plan to SIM lock devices for 60 days after purchase if purchased at full retail or from a retail partner, so that they can’t be used on another network. Once 60 days is up, the lock will be “automatically” removed. As for prepaid, there will also be a 60 day lock. To recap, Verizon plans to lock phones for a minimum of 60 days post purchase. In addition, if you buy a phone on a device payment plan, your phone could remain locked for the entire term of that contract, which for many, is 24 months. To prevent identity theft and other fraudulent activities, we can block the phones you buy from us or our retail partners for postpaid service up to 60 days after purchase. After 60 days, we will automatically remove the blockade. In addition, to reserve our 0% special financing rate for consumers who want to use their phones exclusively in the Verizon network, we can block the phones you buy through our device payment plan during the term of your sales agreement. of the payment plan of the device, after which we will automatically remove the blocking. Telephones purchased at the total retail price or from other sources will not be subject to this block, although they may still be subject to the 60-day blockage detailed above. We do not block our 3G phones when we sell them, except for our 3G World devices that are not iPhone. The simple code to program those 3G phones to use with another provider is “000000” or “123456”. If your phone’s user guide does not have instructions to access the programming menu, you can dial * 611 from your Verizon Wireless phone or call 800.922.0204 for assistance. The SIM cards used in our 3G World devices that are not iPhone are blocked. We will unblock a SIM card upon request. In order to deter arbitration and similar fraudulent activities, we may block the phones you buy from us or our retail partners for prepaid service up to 60 days after purchase. After 60 days, we will automatically remove the blockade. We do not block our 3G phones, except for the new prepaid 3G phones. The simple code for programming those prepaid 3G phones to use with another provider is “000000” or “123456”. If your phone’s user guide does not have instructions to access the programming menu, you can dial * 611 from your Verizon Wireless phone or call 888.294.6804 for assistance. New prepaid 3G phones can only be used with our prepaid service for 6 months after activation and are blocked in the Verizon Wireless network for 12 months after activation. After 6 months, the restriction of our prepaid service is automatically removed. If the service is disconnected within the first 6 months, a new period of 6 months will start if the phone is reactivated. After 12 months, you can dial * 611 from your Verizon Wireless prepaid phone or call 888.294.6804 and we’ll give you programming instructions so you can unlock your phone. If your phone’s user guide does not provide instructions to access the programming menu, we can also help you with that. Verizon first acknowledged that new device lock changes were coming back in February and suggested at the time that a new policy would arrive by the spring. As we noted last week, we’re almost into the fall and have heard nothing. Well, now we know. I’m still not sure how Verizon thinks this move doesn’t violate the Block C spectrum rules they adopted years ago. Then again, we’ve currently got a very industry-friendly FCC who would need to enforce them. We don’t yet know when Verizon will begin rolling this out. Once we have dates, we’ll be sure to share. NOTE: Title of the post has been updated to add info from the statement that Verizon provided us.